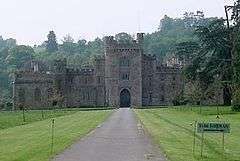 For more details on English castles, see Castles in Great Britain and Ireland. This list of castles in England is not a list of every building and site that has "castle" as part of its name, nor does it list only buildings that conform to a strict definition of a castle as a medieval fortified residence. 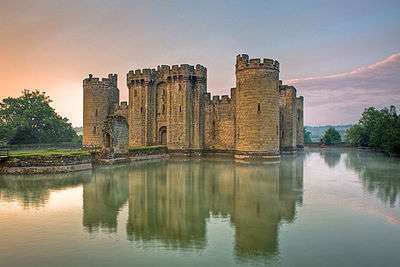 It is not a list of every castle ever built in England, many of which have vanished without trace, but is primarily a list of buildings and remains that have survived. In almost every case the buildings that survive are either ruined, or have been altered over the centuries. 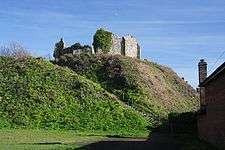 For several reasons, whether a given site is that of a medieval castle has not been taken to be a sufficient criterion for determining whether or not that site should be included in the list. Castles that have vanished or whose remains are barely visible are not listed, except for some important or well-known buildings and sites. 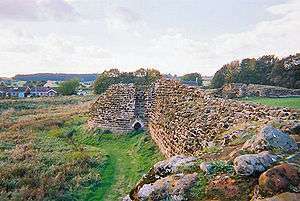 Fortifications from before the medieval period are not listed, nor are architectural follies. In other respects it is difficult to identify clear and consistent boundaries between two sets of buildings, comprising those that indisputably belong in a list of castles and those that do not. 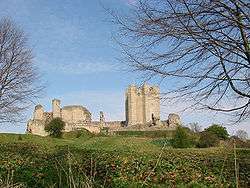 The criteria adopted for inclusion in the list include such factors as: how much survives from the medieval period; how strongly fortified the building was; how castle-like the surviving building is; whether the building has been given the title of "castle"; how certain it is that a medieval castle stood on the site, or that the surviving remains are those of a medieval castle; how well-known or interesting the building is; and whether including or excluding a building helps make the list, in some measure, more consistent. In order to establish a list that is as far as possible comprehensive as well as consistent, it is necessary to establish its boundaries. Before the list itself, a discussion of its scope includes lengthy lists of buildings excluded from the main lists for various reasons. The Castellarium Anglicanum, an authoritative index of castles in England and Wales published in 1983, lists over 1,500 castle sites in England. Many of these castles have vanished or left almost no trace. 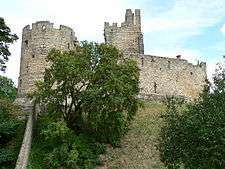 The present list includes more than 800 medieval castles of which there are visible remains, with over 300 having substantial surviving stone or brick remains. A castle is a type of fortified structure, developed in Europe during the Middle Ages. The first castles appeared in France in the 10th century, and in England during the 11th century. 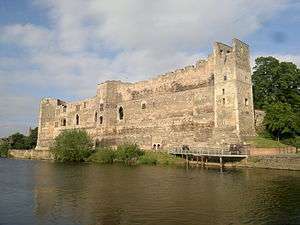 A few castles are known to have been built in England before the Normans invaded in 1066; a great many were built in the years following, the principal mechanism by means of which the Normans were able to consolidate their control over the country. Whilst a few important castles, such as the White Tower in the Tower of London, were built of stone, most early castles were motte-and-bailey castles of earthwork and timber, which could be constructed quickly. Some were later rebuilt in stone, but there are a great many castle sites in England where all that is visible today are traces of earthworks. Castles continued to be built in England for several hundred years, reaching a peak of military sophistication in the late 13th century. 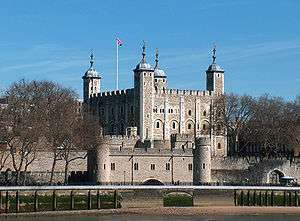 The two principal elements in their construction were the great tower or keep, such as the White Tower, and the fortified enclosure, such as is provided by the outer wall of the Tower of London. During the 14th century, largely as a result of the decline of feudalism, the construction of strong castles began to decline, in favour of more lightly fortified structures often described as fortified manor houses. In the far north of England, where conditions remained unsettled, fortified buildings continued to be built as late as the 16th century, not only by the rich and powerful but by any with adequate means, as defence not against great armies, but against the notorious Border Reivers. Many took the form of the pele tower, a smaller, more modest version of the castle keep, and many of these still survive, often incorporated in later buildings. Castles differed from earlier fortifications in that they were generally private fortified residences. Typically, a castle was the residence of a feudal lord, providing the owner with a secure base from which to control his lands, and also a symbol of wealth and power. 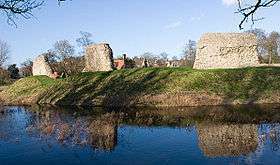 Earlier fortified structures, such as the Saxon burh or the Iron Age hill fort, provided public or communal defences, as did medieval town or city walls. The many Roman forts of which ruins survive in Britain differed in being wholly military in nature - they were camps or strongholds of the Roman army. The Romans also built town or city walls in England, which can still be seen, for instance at Silchester. By the 16th century the role of fortifications had changed once more with the development of artillery capable of breaching even thick stone walls. 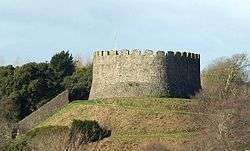 In the reign of Henry VIII, fears of invasion led to the building of a series of new fortresses along the south coast of England, known as the Device Forts or Henrician Castles. These were designed to use and to defend against artillery, and since they were not private residences, but national fortifications, they do not possess what architectural historians have come to see as the defining characteristics of a castle. 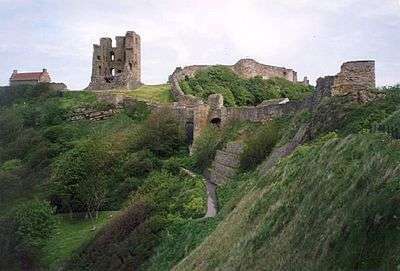 Nonetheless they are visibly castle-like, being compact, with battlemented walls, squat turrets and sometimes a keep; and they were the last generation of fortresses in England to be known as castles, long before architectural historians began to argue that they should not be. 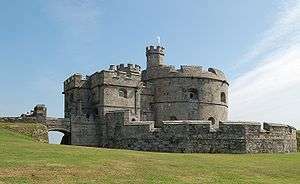 One of them, Pendennis Castle, was one of the last Royalist strongholds to fall to the Parliamentarians during the English Civil War—starvation forcing surrender after a siege of five months. As the role of the castle as fortress declined in the later medieval period, its role as a residence increasingly became the more important. 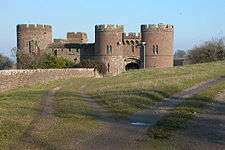 Castles such as Herstmonceux were built with fortifications seemingly designed more for show than for strength, implying a further evolution in the role and concept of the castle, becoming less a means of enforcing power but instead a symbol of its possession, a castle becoming a grand residence proclaiming the status of its owner. Once fortifications had become altogether redundant, it became increasingly rare in England for new buildings to be described as castles, in contrast to France, where country houses continued to be known as châteaux. Once no longer needed as fortresses, castles — if they were not abandoned — were, over the centuries, adapted and modernised to make them more suitable for continued use as residences: large windows were inserted in defensive walls, as at Lumley; outer walls were demolished or lowered to open up views from within, as at Raby; new residential ranges were built to improve and extend accommodation, as at Windsor. 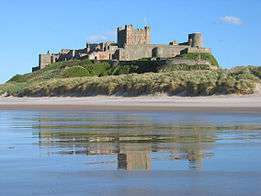 Some castles were restored after falling into ruin, like Bamburgh; others, like Belvoir, were demolished and rebuilt, retaining little or none of the original structure. In the 18th and 19th centuries especially, many castles underwent "improvements" by architects such as Anthony Salvin, and in this period a fashion developed for entirely new houses to be built in the style of castles, and to be known as castles. 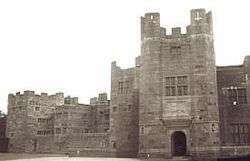 Amongst these was Peckforton Castle, built by Salvin: a building so authentic in its recreation of a medieval castle that it has been described as possibly the last serious fortified home built in Britain. No list of castles in England is ever likely to be complete, because there will never be complete agreement in every case as to whether the remains of a building are those of a castle, whether a given place is the site of a castle, or whether a surviving building should be considered to be a castle. 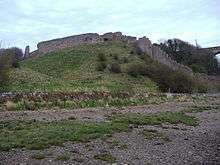 Perhaps because the castle has become the most familiar type of fortification, many sites of fortifications earlier than the 10th century have become known as castles. Most of these are Iron Age hill forts. Amongst the best known are Abbotsbury Castle, Barbury Castle, Bratton Castle, Cadbury Castle, Castle Dore, Chûn Castle, Liddington Castle, Maen Castle, Maiden Castle and Uffington Castle, whilst many more appear in the List of hill forts in England. 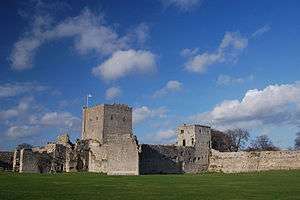 Others, such as Melandra Castle, Reculver Castle, Richborough Castle and Whitley Castle, are Roman forts, whilst Daw's Castle is a Saxon burh. 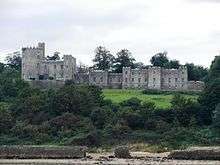 None of these is included in the present list unless it is also the site of a medieval castle, as is the case with, for instance, Portchester Castle, where an imposing castle was built within the surviving walls of the Roman fort. Nor are all medieval fortified sites included in the present list. The remains of town and city walls are excluded — most of these appear in the List of town walls in England and Wales. 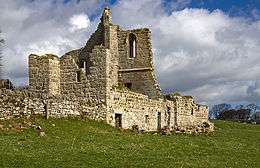 Also excluded are churches with defensive towers, such as Ancroft, Burgh by Sands, Edlingham, Garway, Great Salkeld and Newton Arlosh, as well as other fortified ecclesiastical sites such as Alnwick Abbey, Battle Abbey, Thornton Abbey, Wetheral Priory, Whalley Abbey and St Mary's Abbey, York. 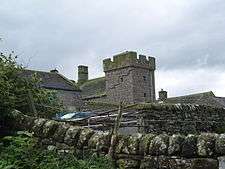 Some of the pele towers of Northern England are included, but the more modest fortified buildings known as bastles are not, though the distinction between them is not always altogether clear. 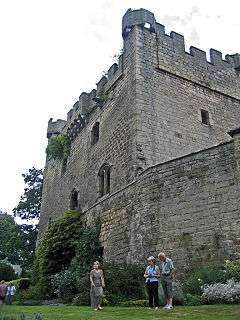 Amongst fortified manor houses, those given the title of castle are included, whilst many others were more lightly fortified and are excluded. Amongst these are Baddesley Clinton, Cowdray House, Farnhill Hall, Hipswell Hall, Ightham Mote, Little Wenham Hall, Markenfield Hall and Walburn Hall. The list includes pele towers that became known as castles, or preserve a castle-like aspect. Many others, or their remains, survive much altered—incorporated in later country houses or farmhouses, and are excluded. Amongst these are: Aske Hall, Biddlestone RC Chapel, Bolling Hall, Bolton Old Hall, Boltongate Rectory, Causey Park House, Clennell Hall, Cliburn Hall, Corbridge Low Hall, Cowmire Hall, Craster Arms (Beadnell), Croglin Old Pele, Denton Hall, Dovenby Hall, Dunstan Hall, East Shaftoe Hall, Godmond Hall, Great Salkeld Rectory, Hardrigg Hall, Hepscott Hall, Hetton Hall, Hollin Hall, Hutton Hall (Penrith), Irton Hall, Johnby Hall, Killington Hall, Kirkoswald College, Levens Hall, Little Harle Tower, Nether Hall, Netherby Hall, Ormside Hall, Pockerley Pele, Preston Patrick Hall, Randalholme Hall, Rock Hall, Rudchester Hall, Sella Park, Selside Hall, Skelsmergh Hall, Smardale Hall, Thistlewood Farmhouse, Warnell Hall, Weetwood Hall and Witton Tower. 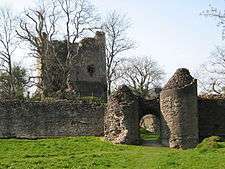 In the post-medieval period, the distinction between true castles and later mock castles is blurred by the extent to which medieval castles were adapted and rebuilt. 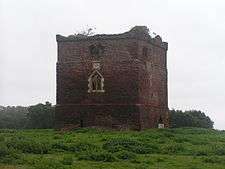 At Greystoke a new castle was built incorporating a medieval pele tower; at Thurland a new castle was built from the ruins of the old; at Belvoir the old castle was demolished and a new one built. 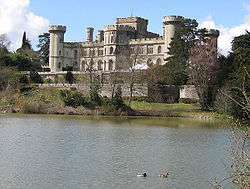 The building of mock castles might be seen as the logical conclusion of a process already apparent in castles such as Herstmonceux or Tattershall, where the castle-like aspect of the building was becoming more for show than for strength. 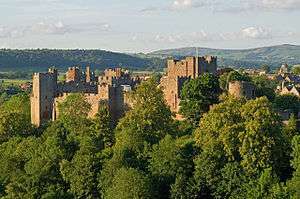 Amongst post-medieval buildings in England that are known as castles, a few, such as Peckforton Castle, closely resemble medieval castles. 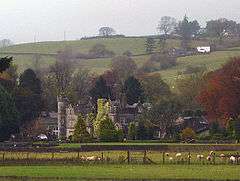 Many others, such as Clearwell Castle, have some castle-like features, and some, like Mereworth Castle, bear no resemblance whatsoever to a castle. The list excludes buildings that neither look like castles, nor incorporate the remains of castles. Amongst these are Bolebroke Castle, Bovey Castle, Bruce Castle, Castle Ashby, Castle Howard, Clifton Castle, Highclere Castle, Mereworth Castle, New Wardour Castle, Sherborne Castle, Wentworth Castle, and Wisbech Castle. Many other buildings with some castle-like features are also excluded. Amongst these are Acton Castle, Allerton Castle, Augill Castle, Avon Castle, Bell's Castle, Bolesworth Castle, Bude Castle, Castle Eden Castle, Castle Goring, Cave Castle, Clearwell Castle, Cliffe Castle, Coates Castle, Creech Castle, Droskyn Castle, Edmond Castle, Enmore Castle, Ewell Castle, Farleigh Castle, Farley Castle, Fillingham Castle, Hatherop Castle, Headingley Castle, Highcliffe Castle, Hilfield Castle, Kenwith Castle, Kirby Knowle Castle, Knepp Castle, Luscombe Castle, Midford Castle, Mulgrave Castle, Otterburn Tower, Pentillie Castle, Reeve Castle, Ryde Castle, St. Clare Castle, Sibdon Castle, Sneaton Castle, Stanhope Castle, Studley Castle, Swinton Castle, The Citadel (Weston-under-Redcastle), Tregenna Castle, Vanbrugh Castle, Wadhurst Castle, Wattisham Castle, Whitehaven Castle, Whitstable Castle, Willersley Castle, and Willsbridge Castle. 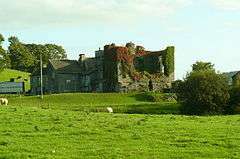 Amongst those that have been demolished is Steephill Castle. Artificial ruins and follies, often built as memorials or landscape features, are also excluded. Amongst these are Appley Tower, Black Castle, Bladon Castle, Blaise Castle, Bollitree Castle, Boston Castle, Braylsham Castle, Broadway Tower, Carr Hall Castle, Castlebourne, Clent Castle, Clopton Tower, Dinton Castle, Doyden Castle, Dunstall Castle, Durlston Castle, Fort Putnam, Hadlow Castle, Castle in Hagley Park Lawrence Castle, Long's Park Castle, Mow Cop Castle, Mowbray Castle, Pirton Castle, Radford Castle, Radway Tower, Ragged Castle (Badminton), Rivington Castle, Rodborough Fort, Ross Castle, Rothley Castle, Roundhay Castle, Sebergham Castle, Severndroog Castle, Shaldon Castle, Sham Castle (Bath), Sledmere Castle, Speedwell Castle, Stainborough Castle, Starlight Castle, Stowe Castle, Strattenborough Castle, Sundorne Castle, Toll House (Clevedon) and Wyke Castle. Finally, the 16th-century Henrician Castles, whose design was closely inspired by medieval castles, are included, but later military fortifications—with just a few exceptions—are not. However carefully the criteria for including a building or site on this list are set out, borderline cases are inevitable. 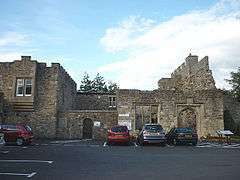 Many buildings known to incorporate northern pele towers in their fabric, but are no longer castle-like—such as the Red Lion Tower in Haltwhistle—have been excluded. 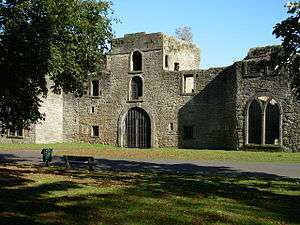 On the other hand, Corby Castle, in which a pele tower survives wholly encased in a later building, is included because it is known as a castle, and by implication continued to fulfil the role of one, at least in part. Kimbolton Castle is included as the site of a medieval castle, and because the present mansion has a castellated aspect in deference to the medieval castle it replaced. 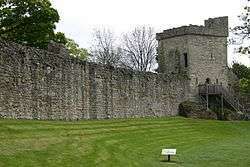 † Bedford Castle was demolished after a well-documented eight-week siege by Henry III, with around 2000 men, in 1224. Someries Castle Fortified manor house 1401 !15th century Fragmentary remains HC ! 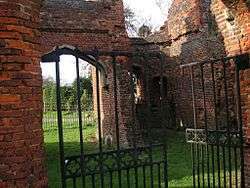 Brick, unfinished, ruined gatehouse and chapel survive. Donnington Castle Castle 1386 !c. 1386 Fragment EH ! 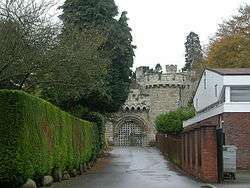 Built by Richard Abberbury the Elder, destroyed during the English Civil War, gatehouse survives. 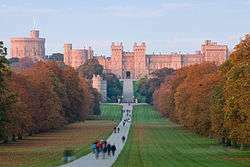 Windsor Castle Keep and bailey 1101 !12–19th century Intact Royal palace Restored and extended by James Wyatt and Jeffry Wyattville, 1800–30. 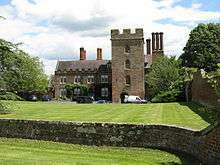 Boarstall Tower Fortified manor house 1312 !c. 1312 Fragment ENT ! Moated site, gatehouse survives, altered in the 16–17th centuries, converted to house 20th century. 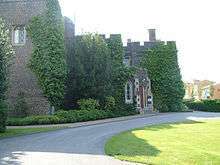 Buckden Palace Fortified manor house 1201 !13–15th century Fragment Claretian conference centre Renamed Buckden Towers, partly demolished and remnants incorporated with a 19th-century house. 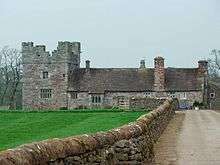 Elton Hall Fortified manor house 1477 !c. 1477 Fragment HH ! Gatehouse survives, incorporated in building of 1662–1689, remodelled and extended in the 18–19th centuries. Kimbolton Castle Castellated house 1601 !17–18th century Intact School Site of medieval castle, rebuilt and later remodelled by Sir John Vanbrugh 1707–10. Kirtling Tower Fortified manor house 1530 !c. 1530 Fragment NGS 16th-century gatehouse on supposed site of moated Saxon castle. Longthorpe Tower Tower house 1263 !1263–1300 Intact EH ! Elaborate scheme of domestic medieval wall paintings. Northborough Castle Fortified manor house 1330 !1330–40 Fragment Private Gatehouse and hall survive, with 16/17th-century alterations. Woodcroft Castle Quadrangular castle 1280 !c. 1280 Habitable fragment Private West range of original building survives, with alterations. Beeston Castle Enclosure castle 1201 !13–14th century Ruins EH ! Sited on crag high above Cheshire Plain, 19th-century outer gatehouse. Chester Castle Keep and bailey 1101 !12th century Fragment EH ! Agricola tower sole feature of medieval castle to survive an 18th-century fire. 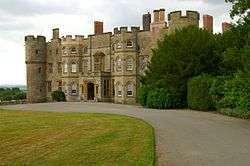 Cholmondeley Castle Neo-romantic castle 1801 !1801–19 Intact HH ! Marquess of Cholmondeley Transformed into castle by Smirke, 1817–19. 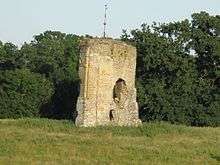 Doddington Castle Tower house 1403 !c. 1403 Substantially intact Private Also known as Delves Hall. Building At Risk. 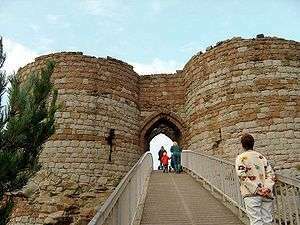 Halton Castle Castle 1201 !13th century Fragmentary remains HC ! Duchy of Lancaster Commanding position, 13th-century tower, 18th-century courthouse, folly of c. 1800. 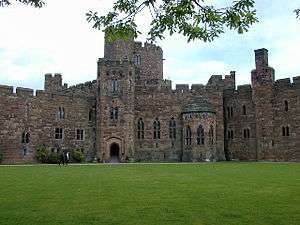 Peckforton Castle Neo-romantic castle 1844 !1844–50 Intact Hotel By Anthony Salvin, possibly the last serious fortified home built in Britain. Auckland Castle Keep and bailey 1101 !12–16th century Rebuilt HH ! 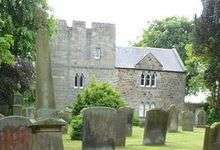 Church of England Mostly 16th-century, fragments remain of medieval castle, residence of the Bishop of Durham. Bowes Castle Keep 1101 !12th century Fragmentary remains EH ! Ruins of keep survive. Brancepeth Castle Keep and bailey 1301 !14–19th century Reconstructed Private Substantial medieval portions, including 5 towers incorporated in 19th-century rebuilding. Durham Castle Keep and bailey 1001 !11–14th century Rebuilt University College, Durham Much altered during continuous occupation since c. 1072. Lambton Castle Neo-romantic castle 1820 !c. 1820–8 Intact Wedding venue / Earl of Durham Later additions demolished following subsidence. Lumley Castle Quadrangular castle 1392 !c. 1392 Intact Hotel / Earl of Scarbrough Altered c. 1580 and 1721. Mortham Tower Fortified manor house 1301 !14–16th century Intact Private 15th-century tower, formerly in Yorkshire. 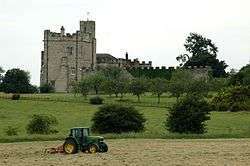 Raby Castle Castle 1101 !12–14th century Intact HH ! Lord Barnard Altered in the 18–19th centuries. Raby Old Lodge Tower house 1501 !16th century Restored Holiday accommodation Probably built as a hunting lodge for the Neville family of Raby Castle. Scargill Castle Tower house 1201 !13–15th century Fragment Private, farm Amongst farm buildings. Walworth Castle Sham castle 1601 !c. 1600 Restored Hotel South-west tower and adjoining wall possibly medieval. 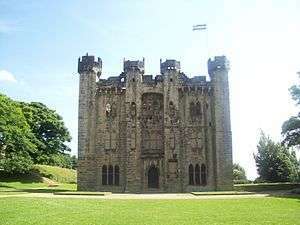 Witton Castle Castle 1410 !c. 1410 Restored Caravan site Extended in 1790–95. Used as a leisure centre for a caravan site. 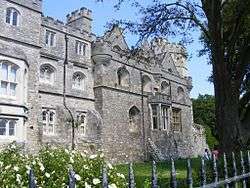 Caerhays Castle Neo-romantic castle 1807 !1807–10 Intact HH ! Built in 1808 by John Nash. 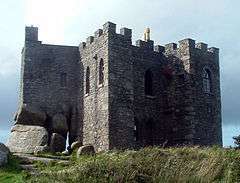 Carn Brea Castle Sham castle 1401 !15–19th century Intact Restaurant Possible medieval hunting lodge rebuilt in the 18–19th centuries. Ince Castle Semi-fortified house 1640 !c. 1640 Intact NGS House may have been held against the Roundheads in 1646. Pendennis Castle Artillery fort 1540 !1540–98 Intact EH ! Withstood 5-month siege in 1646. 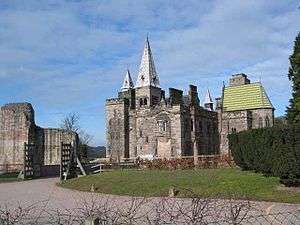 Pengersick Castle Fortified manor house 1510 !c. 1510 Fragment HH ! 4-storey tower remains, with later building. Place House, Fowey Tower house 1401 !15–19th century Rebuilt Private Original tower house defended against the French in 1475, subsequently strengthened, later rebuilt. St Catherine's Castle Artillery fort 1538 !1538–40 Ruins EH ! 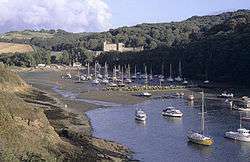 At mouth of River Fowey. St. Mawes Castle Artillery fort 1540 !1540–3 Intact EH ! Position not defensible from land attack. 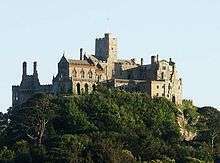 St. Michael's Mount Fortified site 1101 !12–17th century Substantially intact ENT ! Castle and priory church comprise single building. Appleby Castle Keep and bailey 1101 !12–17th century Restored Private Restored in the 17th century by Lady Anne Clifford. Armathwaite Castle Tower house 1401 !15th century Intact Private Incorporated in later buildings. Arnside Tower Tower house 1401 !15th century Ruins Private Freestanding tower house. Askerton Castle Castle 1301 !14–16th century Restored Private, farm Altered by Anthony Salvin. Bewcastle Castle Courtyard castle 1301 !14–15th century Fragmentary ruins HC ! Sited within Roman fort. Bewley Castle Fortified manor house 1201 !13–14th century Fragmentary ruins Private Once a residence of the Bishops of Carlisle. 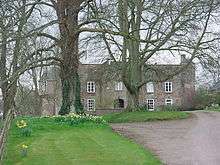 Blencow Hall Fortified house 1401 !15–16th century Intact Holiday accommodation Altered in 1590. 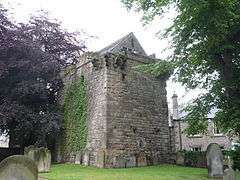 Brackenburgh Old Tower Pele tower 1301 !14–15th century Substantially intact Private Adjoining large 19th-century house. Brackenhill Tower Tower house 1586 !1586 Intact Holiday accommodation Restored 21st century. Branthwaite Hall Pele tower 1301 !14–15th century Intact Private 17th-century additions. Brough Castle Keep and bailey 1001 !11–14th century Ruins EH ! Restored in 1659–62 by Lady Anne Clifford. Brougham Castle Keep and bailey 1201 !13–14th century Ruins EH ! Converted into country house in 17th century by Lady Anne Clifford. 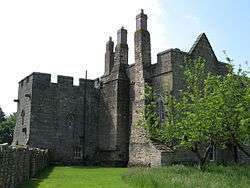 Brougham Hall Fortified manor house 1201 !13–19th century Ruins Crafts centre Ruins of 19th-century house incorporating remains of earlier building. Broughton Tower Pele tower 1301 !14th century Intact School Incorporated in later building. 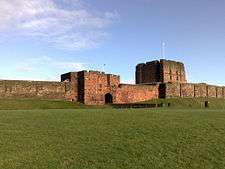 Carlisle Castle Keep and bailey 1101 !12–15th century Substantially intact EH ! Converted to barracks 19th century. Catterlen Hall Tower house 1401 !15th century Intact Private Later additions. Clifton Hall Pele tower 1501 !16th century Substantially intact EH ! Used as a farm building until 1973. Cockermouth Castle Enclosure castle 1201 !13–14th century Partly restored Private 19th-century additions. Corby Castle Tower house 1201 !13th century Rebuilt Private Concealed within a Georgian Mansion House. Dacre Castle Tower house 1301 !14th century Restored Private Restored in the 17th and 19th centuries. Dalston Hall Fortified house 1401 !15th century Intact Hotel Later additions. Dalton Castle Pele tower 1301 !14th century Restored ENT ! Remodelled c. 1704 and 1856. Drawdykes Castle Tower house 1301 !14th century Intact Private, farm Original tower with early Classical Revival facade. 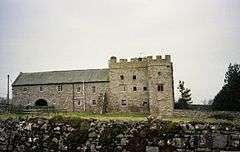 Drumburgh Castle Tower house 1301 !14th century Habitable Private Converted into farmhouse. Gleaston Castle Enclosure castle 1301 !14th century Fragmentary remains Private Abandoned late 15th century. 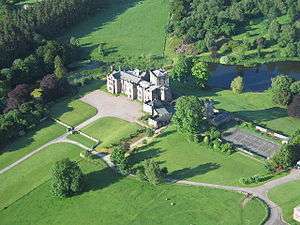 Greystoke Castle Castle 1301 !14–19th century Rebuilt Wedding venue Rebuilt incorporating parts of 14th-century building, remodelled in 1840 by Anthony Salvin. Harbybrow Tower Pele tower 1401 !15th century Ruin Private Adjoining 19th-century farmhouse. 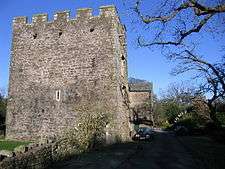 Hayton Castle Tower house 1301 !14–15th century Substantially intact Private Castle converted to house. Hazelslack Tower Pele tower 1301 !14th century Ruins Private Near Arnside. Howgill Castle Tower house 1301 !14th century Substantially intact Private Altered and remodelled in the 17–18th century. Hutton-in-the-Forest Pele tower 1301 !14–19th century Intact HH ! Large country-house extensions. Hutton John Pele tower 1301 !14th century Intact HH ! Later alterations and additions. Ingmire Hall Pele tower 1501 !16–20th century Rebuilt Private apartments Incorporated in large, mostly 19th-century mansion. Isel Hall Tower house 1301 !14–15th century Intact HH ! Later additions. Linstock Castle Tower house 1101 !12–13th century Substantially intact Private Altered and remodelled in the 17–20th century. 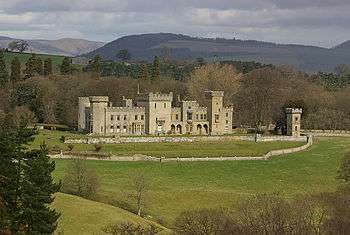 Lowther Castle Neo-romantic castle 1806 !1806–14 Ruins HH ! Shell of a 19th-century castle by Smirke, on site of medieval hall. Middleton Hall Fortified manor house 1301 !14th century Habitable Private Altered and extended in the 15–19th centuries. 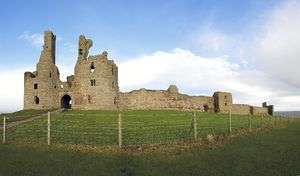 Millom Castle Castle 1301 !14th century Ruins HC ! 16–17th-century farmhouse built into ruins. 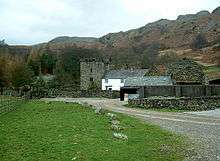 Muncaster Castle Tower house 1201 !13–14th century Restored HH ! Remodelled by Anthony Salvin, home of Tom Fool, 16th-century jester. Earl of Carlisle Altered and restored in the 18th and 19th centuries. 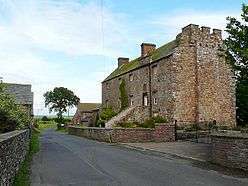 Newbiggin Hall Fortified house 1401 !15–16th century Intact Private Remodelled by Anthony Salvin. Piel Castle Castle 1301 !14–15th century Ruins EH ! 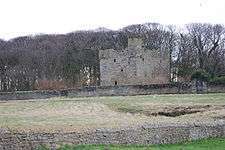 Also known as Fouldrey Castle. Prior's Tower, Carlisle Pele tower 1401 !15th century Intact Church of England Part of the Deanery, alongside later buildings. Rose Castle Quadrangular Castle 1401 !15–16th century Restored Church of England Converted to private house 17th century, residence of the Bishop of Carlisle until 2011. Scaleby Castle Tower house 1201 !13–15th century Partly ruined Private Incorporated with later house. Sizergh Castle Tower house 1301 !14–16th century Restored ENT ! Altered in the 18–20th centuries. Toppin Castle Sham castle 19 !19th century Intact Private Imitation tower house. Ubarrow Hall Pele tower 1401 !Medieval Substantially intact Private Alongside later building, reduced in height. Whitehall, Mealsgate Tower house 1301 !14–15th century Substantially intact Holiday accommodation Alterations by Anthony Salvin. 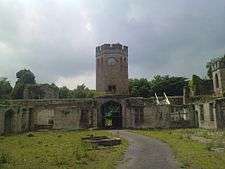 Workington Hall Tower house 1301 !14–18th century Ruins Local authority Inhabited until 1929, requisitioned by the army in the Second World War and since allowed to fall into ruin. 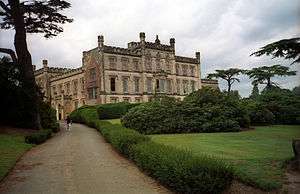 Also known as Curwen Hall. Wraysholme Tower Tower house 1401 !15th century Substantially intact Private, farm Used as barn and cow-house, adjoining a 19th-century house. Yanwath Hall Pele tower 1401 !15th century Intact Private Adjoining later building. 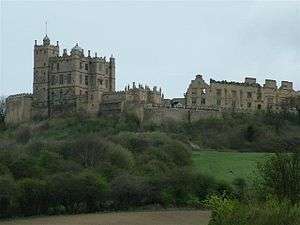 Bolsover Castle Castle 1101 !12–17th century Rebuilt EH ! Castle rebuilt as a 17th-century mansion. Elvaston Castle Castellated house 1601 !17–19th century Derelict Derbyshire County Council Built in 1633, remodelled by James Wyatt in 19th century, now within country park. Building At Risk. 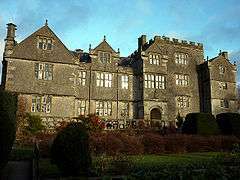 Haddon Hall Fortified manor house 1301 !14–15th century Intact HH ! Altered in the 16–17th centuries, restored in the 1920s. Mackworth Castle Fortified manor house 1401 !15th century Fragment Private Ruined gatehouse adjoining farm. 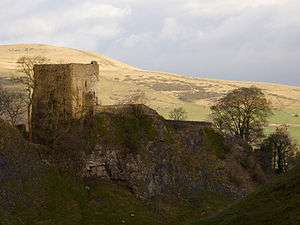 Peveril Castle Keep and bailey 1001 !11–14th century Ruins EH ! Commanding position above ravine. 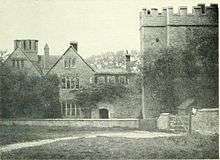 Riber Castle Sham castle 1868 !1868 Ruins Private School 1892–1930. 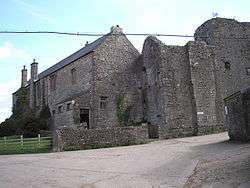 Wingfield Manor Fortified manor house 1401 !15th century Ruins EH ! Abandoned in the 18th century. Affeton Castle Fortified manor house 1401 !15th century Fragment Private Gatehouse of house sacked during English Civil War, with 19th-century alterations. Berry Pomeroy Castle Enclosure castle 1401 !15th century Ruins EH ! Very late castle, designed to defend against artillery. Bickleigh Castle Fortified manor house 1401 !15th century Restored Wedding venue Incorporated in later buildings. Compton Castle Fortified manor house 1301 !14–16th century Restored ENT ! Used as farm after 1750, restored 20th century. 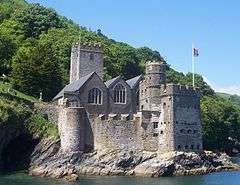 Dartmouth Castle Castle 1481 !1481 Restored EH ! Converted to artillery castle 1509–47. Castle Drogo Neo-romantic castle 1911 !1911–1930 Intact ENT ! By Edwin Lutyens. Marisco Castle Keep and bailey 1243 !c. 1243 Restored ENT ! Restored in 1643. 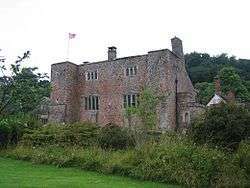 Powderham Castle Fortified manor house 1301 !14–16th century Restored HH ! Earl of Devon Remodelled in the 18th and 19th centuries. 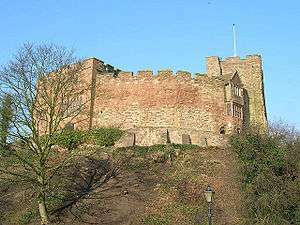 Rougemont Castle (Exeter) Castle 1001 !11–12th century Fragments Wedding venue Medieval fragments survive with later buildings. Salcombe Castle Artillery fort 1540 !1540s Ruins HAL ! Refortified in 1643–45. 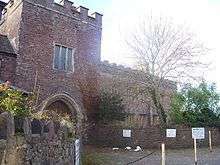 Tiverton Castle Quadrangular castle 1301 !14th century Partly habitable HH ! 16th-century house built within the castle. Totnes Castle Shell keep 1001 !11–14th century Ruins EH ! Well-preserved keep on high motte. Brownsea Castle Castellated house 1501 !16–19th century Intact ENT ! 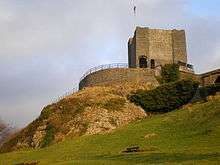 Incorporates part of a 16th-century Henrician Castle. Christchurch Castle Motte and bailey 1101 !12–14th century Fragmentary remains EH ! Hall house known as Constable's House survives, with rare Norman chimney. Corfe Castle Keep and bailey 1001 !11–13th century Extensive ruins ENT ! Besieged and slighted during the English Civil War. Lulworth Castle Sham castle 1610 !c. 1610 Restored EH ! Hunting lodge, gutted by fire 1929. 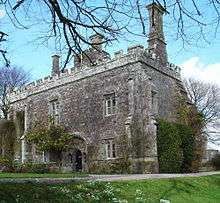 Pennsylvania Castle Neo-romantic castle 1801 !1800 Intact Private On the Isle of Portland, built for John Penn to designs by James Wyatt. Portland Castle Artillery fort 1539 !1539 Intact EH ! Private residence 1816–70. Rufus Castle Castle 1401 !15th century Ruins Private Also known as Bow and Arrow Castle. Sherborne Old Castle Keep and bailey 1101 !12th century Ruins EH ! 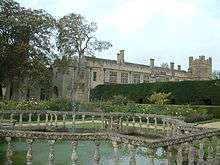 Replaced by 16–17th century house, which became known as Sherborne Castle. 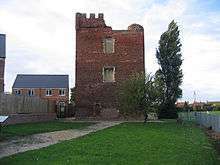 Paull Holme Tower Tower House 1401 !15th century Ruins Private Originally part of larger house, roofless. Skipsea Castle Motte and Bailey 1001 !11th century Earthworks EH ! Well-preserved earthworks. Wressle Castle Quadrangular castle 1390 !1390 Ruins Private, farm South range remains, inhabited until gutted by fire in 1796. Bodiam Castle Quadrangular castle 1385 !c. 1385 Ruins ENT ! Wide moat. Camber Castle Artillery fort 1540 !c. 1540 Ruins EH ! "Dismantled" 1642 after sea receded. Hastings Castle Keep and bailey 1101 !12th century Fragmentary ruins HC ! Local Authority Ruined by 1399. Herstmonceux Castle Fortified mansion 1401 !15th century Restored Queen's University Brick, interior dismantled in 1777, restored 20th century, former home of Royal Greenwich Observatory, now Study Centre. Pevensey Castle Keep and bailey 1101 !12th century Ruins EH ! 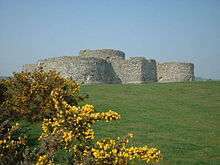 Castle built within surviving walls of Roman fort of Saxon Shore. Rye Castle (Ypres Tower) Tower House 1250 !c. 1250 Intact HM ! Originally called Baddings Tower. Colchester Castle Tower keep 1001 !11th century Intact HM ! Local authority Reduced in height in 17th century. 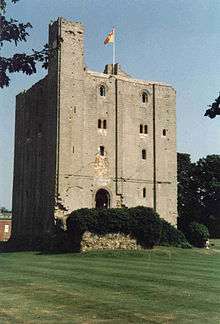 Hedingham Castle Tower keep 1130 !1130–40 Substantially intact HH ! Castle demolished in the 17th century except for keep, well-preserved interior despite fire of 1954. Walden Castle Keep and bailey 1101 !12th century Fragmentary remains HC ! Remains of keep. Berkeley Castle Keep and bailey 1101 !12–14th century Intact HH ! Largely unaltered until the 1920s, when interior modernised by 8th Earl of Berkeley. Beverstone Castle Pentagonal castle 1201 !13–15th century Ruins NGS 17th-century house built within ruins. St. Briavel's Castle Keep and bailey 1201 !13th century Habitable EH ! Youth hostel. Sudeley Castle Quadrangular castle 1401 !15th century Restored HH ! Restored as a country house in the 19th century. Thornbury Castle Fortified house 1511 !c. 1511 Substantially intact Hotel Restored in the 19th century. Tower of London Concentric castle 1001 !11–13th century Intact Historic Royal Palaces White Tower built c. 1077–1100, curtain walls added in the 13th century, working portcullis. Radcliffe Tower Tower house 1403 !1403 Fragment HC ! Local authority Ruinous tower formerly incorporated in timber house. Calshot Castle Artillery fort 1501 !16th century Substantially intact EH ! Altered in the 18–20th centuries, in use until 1961. Hurst Castle Artillery fort 1501 !16th century Substantially intact EH ! Repaired and refortified in the 19th century. 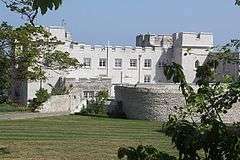 Netley Castle Artillery fort 1501 !16–19th century Rebuilt Convalescent home Remodelled and extended in 1885–90. Odiham Castle Shell keep and bailey 1201 !Early 13th century Fragmentary ruins HC ! Local authority Built by King John. Portchester Castle Keep and bailey 1001 !11–12th century Extensive ruins EH ! Built within surviving walls of Roman fort of the Saxon Shore. 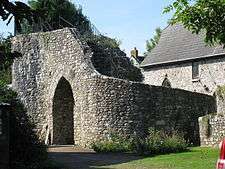 Southampton Castle Keep and bailey 1001 !11–14th century Fragments HAL ! North bailey wall survives. Southsea Castle Artillery fort 1501 !16th century Rebuilt HC ! Winchester Castle Motte and bailey 1001 !11–13th century Fragment HC ! 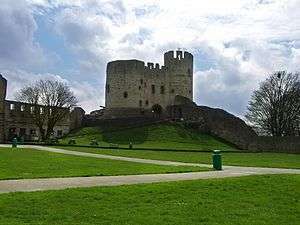 † Ewyas Harold Castle is recorded in the Domesday Book and was probably built c. 1048. 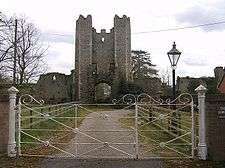 Brampton Bryan Castle Castle 1201 !13–14th century Ruins Private Gatehouse survives. Clifford Castle Motte and bailey 1001 !11–13th century Fragments Private Building At Risk. Croft Castle Quadrangular castle 1301 !14th century Rebuilt ENT ! Converted to a 16/17th-century house. Downton Castle Neo-romantic castle 1774 !c. 1774–78 Intact Private Altered and extended in 1860–70. Eastnor Castle Neo-romantic castle 1811 !1811–20 Intact HH ! By Robert Smirke. Goodrich Castle Concentric castle 1101 !12–13th century Ruins EH ! 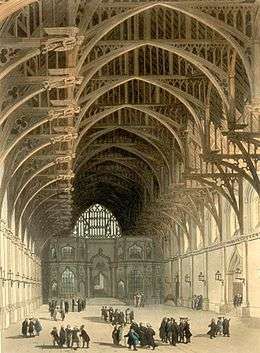 Partly demolished during English Civil War. Hampton Court Fortified manor house 1427 !1427 Intact HH ! Remodelled in 1830–40s. 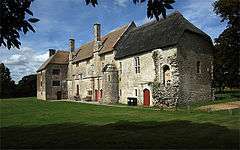 Kentchurch Court Fortified manor house 1301 !14th century Fragment HH ! Medieval tower and gateway survive, remainder largely rebuilt by Nash 1795–1807. Kinnersley Castle Castle 1301 !Medieval Rebuilt HH ! 16–17th-century house on the site of a medieval castle. Longtown Castle Keep and bailey 1101 !12–13th century Fragmentary ruins EH ! Circular keep. Pembridge Castle Keep and bailey 1101 !12–13th century Partly habitable Private Reconstructed 20th century. Treago Castle Fortified manor house 1401 !15–16th century Restored Private Altered in the 17–19th centuries. 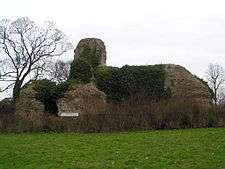 Wigmore Castle Keep and bailey 1001 !11–14th century Fragmentary ruins EH ! Partly dismantled in 1643. Wilton Castle Castle 1201 !13th century Fragmentary ruins HC ! Remains incorporated in a 19th-century house. Berkhamsted Castle Motte and bailey 1001 !11–13th century Fragmentary remains EH ! Double Moat. Unoccupied since 1495. Hertford Castle Motte and bailey 1001 !11–12th century Fragments Local authority 15th-century gatehouse survives, altered and extended in the 18–20th centuries. 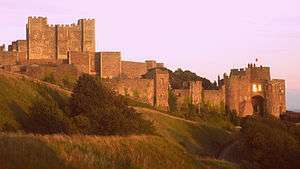 Carisbrooke Castle Keep and bailey 1101 !12–14th century Substantially intact EH ! 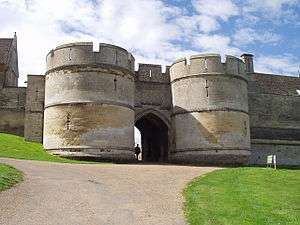 Refortified in the 1590s as artillery fortress, former seat of the Governor of the Isle of Wight. Norris Castle Neo-romantic castle 1801 !c. 1800 Intact Private Gothic Revival, by James Wyatt. Yarmouth Castle Artillery fort 1547 !1547 Substantially intact EH ! Altered in the 17th century. West Cowes Castle Artillery fort 1501 !16–19th century Rebuilt Royal Yacht Squadron Fragments of a 16th-century structure incorporated in a later building. Star Castle Artillery fort 1593 !1593 Intact Hotel Important and complete example of Elizabethan fort. Allington Castle Fortified house 1201 !13–14th century Restored Wedding venue Restored in 1905–1929. Canterbury Castle Tower keep 1101 !12th century Ruins HC ! Chiddingstone Castle Neo-romantic castle 19 !19th century Intact HH ! 17th-century building converted to a castle in the 19th century. 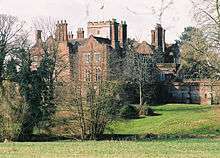 Chilham Castle Keep and bailey 1001 !11–14th century Intact NGS Keep survives with Jacobean house. Cooling Castle Keep and bailey 1380 !1380s Part ruined Wedding venue Well-preserved gatehouse survives, barns used for events. Deal Castle Artillery fort 1501 !16th century Intact EH ! Formerly residence of Captain of the Cinque Ports. Dover Castle Concentric castle 1101 !12–13th century Intact EH ! Adapted for modern warfare 18–19th centuries. Hever Castle Fortified manor house 1301 !14th century Restored HH ! Restored early 19th century, working portcullis. Kingsgate Castle Neo-romantic castle 1701 !18–19th century Intact Private apartments Built c. 1760, rebuilt late 19th century. Leeds Castle Castle 1101 !12–15th century Restored HH ! Extensively rebuilt in 1822 and 1926. 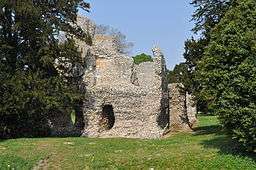 Leybourne Castle Castle 1201 !13th century Fragmentary ruins Private 16th-century house partly incorporating ruins, rebuilt in 1931. 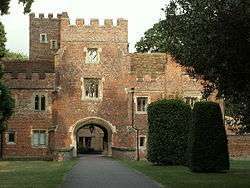 Lullingstone Castle Semi-fortified house 1543 !1543–80 Fragment HH ! 16th-century gatehouse incorporated into a later house. Lympne Castle Fortified house 1201 !13–14th century Restored Wedding venue Restored and extended in 1907–12. Otford Palace Fortified manor house 1515 !16th century Ruins HC ! 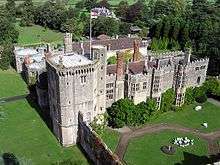 Penshurst Place Fortified manor house 1301 !14–15th century Fragment HH ! 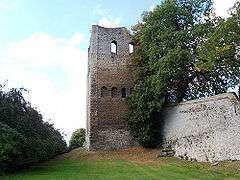 Remodelled in the 19th century, single tower and stretch of wall survive from fortifications of c. 1400. Rochester Castle Tower keep 1127 !1127 Ruins EH ! Keep 125 ft (38 m) high to top of turrets. Sandgate Castle Artillery fort 1539 !1539–40 Substantially intact Private Altered in 1805–06. Scotney Castle Fortified manor house 1378 !1378–80 Fragment ENT ! Single surviving tower incorporated in later house. Sissinghurst Castle Fortified manor house 1401 !15th century Rebuilt ENT ! No fortifications remaining. Starkey Castle Manor house 1301 !14th century Fragment Private Fine medieval hall-house remains from possibly fortified manor house. Stone Castle Tower 1101 !12th century Intact Wedding venue Medieval tower incorporated in building of 1825. Tonbridge Castle Keep and bailey 1001 !11–13th century Fragment HC ! Walmer Castle Artillery fort 1539 !1539 Intact EH ! 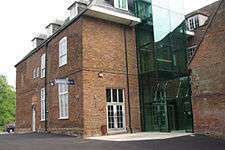 Residence of the Lord Warden of the Cinque Ports from 18th century. 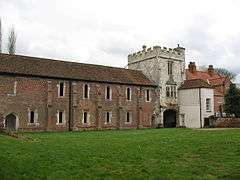 Westenhanger Castle Fortified manor house 1343 !c. 1343 Fragment Wedding venue 18th-century farmouse built within ruins. Ashton Hall Tower house 1301 !14–19th century Intact Lancaster Golf Club Near Stodday, 14th-century tower incorporated into a later building. Borwick Hall Pele tower 1301 !14th century Intact Outdoor education centre Incorporated in mainly 16th-century building. Hornby Castle Keep 1201 !13th century Fragment Private Keep rebuilt early 16th century, incorporated into an 18–19th-century house. Lancaster Castle Keep and bailey 1001 !11–12th century Intact HC ! Local authority Prison from 1745, 20th-century Shire Hall replaced medieval buildings, now Crown Court. 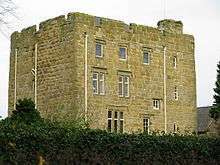 Thurland Castle Fortified manor house 1301 !14–15th century Rebuilt Private apartments Near Tunstall, ruins rebuilt in 1879–85. Turton Tower Pele tower 1401 !15th century Intact HH ! Incorporated in later building. 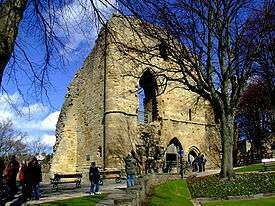 Ashby de la Zouch Castle Keep 1101 !12–15th century Fragmentary ruins EH ! Fortified manor converted to castle in 1474, slighted during English Civil War. 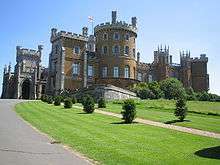 Belvoir Castle Neo-romantic castle 1601 !17–19th century Intact HH ! Duke of Rutland Rebuilt in 1655–68 incorporating fragments of medieval castle, remodelled in 1801–30. Kirby Muxloe Castle Quadrangular castle 1480 !1480–3 Fragmentary ruins EH ! Unfinished. Leicester Castle Castle 1101 !12–13th century Fragments HC ! 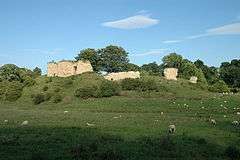 Bolingbroke Castle Enclosure castle 1201 !13–14th century Fragmentary ruins EH ! Slighted after brief siege in 1643. Grimsthorpe Castle Castle 1201 !13th century Fragment HH ! Remodelled in 18th and 19th centuries, retains a 13th-century south-east tower. Lincoln Castle Keep and bailey 1001 !11–13th century Substantially intact HC ! Rochford Tower Fortified house 1401 !15–16th century Fragment Private 2 miles east of Boston. Somerton Castle Quadrangular castle 1281 !1281–1305 Fragment Private Single tower survives, adjoining a 17th-century building. Tattershall Castle Tower 1430 !1430s Intact ENT ! Brick tower built for Ralph Cromwell, restored in 1911–25 by Lord Curzon. Torksey Castle Semi-fortified house 1501 !16th century Fragmentary ruins Private Slighted during English Civil War. Brimstage Hall Tower house 1398 !c. 1398 Substantially intact Crafts centre Tower incorporated in later building of 16th and 19th centuries. 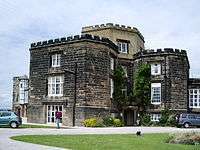 Leasowe Castle Sham castle 1501 !16–19th century Intact Hotel Built in 1593, extended in 1600–42 and the 19th century. Burgh Castle Motte and bailey 1101 !12th century No visible remains EH ! / Norfolk Archaeological Trust Site of medieval motte and bailey castle within surviving walls of Roman fort of Saxon Shore. Caister Castle Quadrangular castle 1432 !1432–46 Fragmentary ruins HC ! Moated, largely brick, built by John Fastolf, a relatively intact 90 ft (27 m) tower remains. Castle Acre Castle Motte and bailey 1001 !11–12th century Fragmentary remains EH ! Extensive earthworks. Norwich Castle Keep 1095 !c. 1095–1110 Intact HM ! Prison during 18–19th centuries. 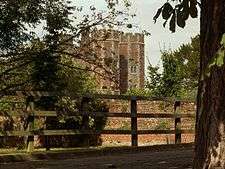 Oxburgh Hall Fortified manor house 1482 !c. 1482 Intact HH ! 18th- and 19th-century additions. Astwell Castle Fortified manor house 1401 !15th century Fragment Private, farm Gatehouse survives alongside a 17th-century house. Rockingham Castle Motte and bailey 1201 !13–19th century Rebuilt HH ! 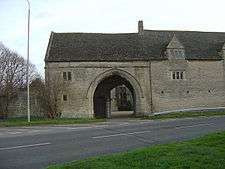 13th century gatehouse survives, largely rebuilt in the 16th century, remodelled in 1660 and by Anthony Salvin in 19th century. Thorpe Waterville Castle Castle 1301 !14th century Fragment Private Great hall with fine open roof survives, altered for use as a barn. 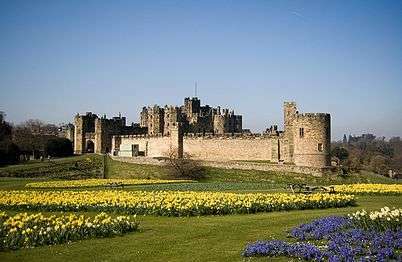 Alnwick Castle Keep and bailey 1101 !12–14th century Restored HH ! Aydon Castle Fortified manor house 1301 !14th century Intact EH ! Converted to farmhouse 17th century. 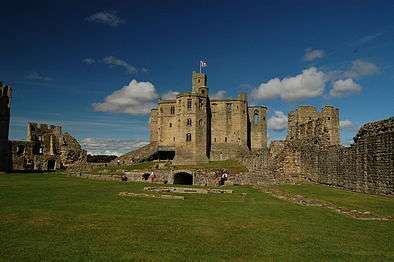 Bamburgh Castle Keep and bailey 1101 !12–14th century Restored HH ! Lord Armstrong Ruinous by 1704, extensively restored in 1894–1904. 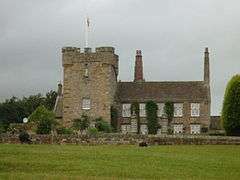 Barmoor Castle Tower house 1301 !14–19th century Rebuilt Private 19th-century mansion incorporating remains of a 14th-century building. Beaufront Castle Neo-romantic castle 1836 !1836–1841 Intact Private 19th-century mansion on the site of a 15th-century tower house. 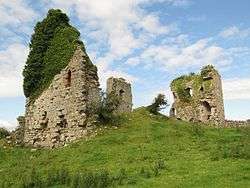 Bellister Castle Castle 1201 !13–14th century Fragmentary remains Private Ruins adjoining a 17th-century house. Belsay Castle Tower house 1439 !1439–60 Intact EH ! Later ruined building attached. Bitchfield Castle Pele tower 1301 !14th century Restored Private Incorporated in later mansion. Blenkinsop Castle Tower house 1301 !14th century Ruins Private Incorporated into a 19th-century house. 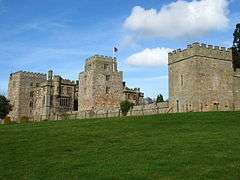 Bothal Castle Castle 1301 !14th century Rebuilt Private Extensively restored in the 19th century. Bywell Castle Castle 1401 !15th century Fragments Private Gatehouse survives. Callaly Castle Pele tower 1301 !14–15th century Intact Private apartments Incorporated in later country house. Chillingham Castle Quadrangular castle 1344 !1344 Intact HH ! Altered in the 17–19th centuries, restored after 1982. Chipchase Castle Tower house 1301 !14th century Intact HH ! Incorporated in Jacobean house, altered in the 18–19th centuries. Cocklaw Tower Tower house 1301 !14–15th century Shell Private, farm Near Wall. Corbridge Vicar's Pele Pele tower 1318 !1318 Intact HAL ! Re-roofed in 1910. Coupland Castle Tower house 1501 !16–17th century Restored Private Later additions. Craster Tower Pele tower 1301 !14–15th century Intact Holiday accommodation Incorporated in later building. Crawley Tower Pele tower 1301 !14th century Ruins Private A cottage was built within the walls in the 18th century. Cresswell Castle Pele tower 1401 !15th century Ruin 18th century-parapet. Dilston Castle Tower house 1401 !15th century Ruins HC ! Altered in the 16–17th century, later buildings demolished. Dunstanburgh Castle Keep and bailey 1301 !14th century Fragmentary ruins EH ! Spectacular coastal setting. Elsdon Tower Pele tower 1501 !16th century Intact Private Altered, rectory until 1960, restored in the 1990s. Embleton Tower Pele tower 1301 !14th century Intact Private 19th-century vicarage attached. Featherstone Castle Castle 1301 !14th century Intact Private 14th-century tower, three further towers added in the 18–19th century. Ford Castle Quadrangular castle 1301 !14th century Substantially intact Private Converted into mansion in the 17th century. Halton Castle Tower house 1201 !13–14th century Intact Private Attached to later house. 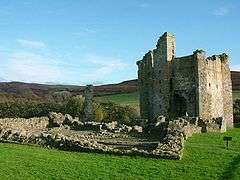 Harbottle Castle Keep and bailey 1101 !12–14th century Fragmentary ruins HAL ! Northumberland National Park Captured by Robert Bruce in 1318. 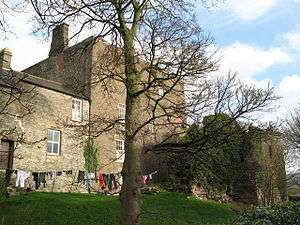 Haughton Castle Tower house 1201 !13–14th century Restored Private Altered in the 18–19th centuries. Hexham Moot Hall and Old Gaol Fortified towers 1301 !14–15th century Intact HM ! 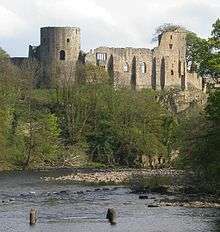 Probably once connected by bailey wall, AD1415 list of castles has "Turris de Hexham". Langley Castle Tower house 1350 !c. 1350 Restored Hotel Restored in the 1890s. Lemmington Hall Tower house 1401 !15th century Restored Wedding venue Incorporated in later house. Lindisfarne Castle Artillery fort 1501 !16th century Restored ENT ! Remodelled by Edwin Lutyens 1901. Morpeth Castle Castle 1342 !1342–9 Fragments Landmark Trust Only gatehouse and a section of wall remain. Norham Castle Keep and bailey 1101 !12th century Ruins EH ! Keep remodelled in 1422–25, partly rebuilt in 1513–15. Preston Tower, Ellingham Pele tower 1401 !c. 1400 Fragment HC ! South wall remains, with two of the original four turrets. Shilbottle Tower Pele tower 1401 !15th century Restored Private Incorporated into a vicarage. Shortflatt Tower Pele tower 1301 !14–15th century Restored Wedding venue Incorporated in later house. 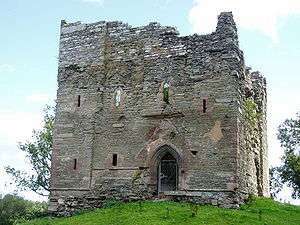 Thirlwall Castle Tower house 1301 !14th century Fragmentary ruins HAL ! Whittingham Tower Pele tower 1201 !13–14th century Restored Private Converted for use as almshouses in 1845. Whitton Tower Pele tower 1386 !c. 1386 Intact Holiday accommodation Near Rothbury, well-preserved. Willimoteswick Castle Fortified manor house 1501 !16th century Ruins Private, farm Incorporates remains of earlier building, largely rebuilt in 1900. Ayton Castle Castle 1201 !13–14th century Fragment HC ! 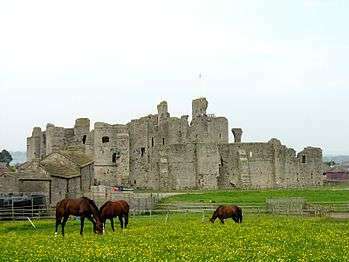 Bolton Castle Quadrangular castle 1301 !14th century Ruins HC ! Besieged and slighted during English Civil War. Cawood Castle Quadrangular castle 1374 !1374–88 Fragments Landmark Trust Largely demolished in 1750, gatehouse survives. 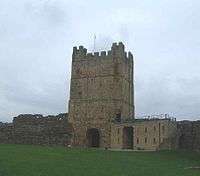 Clifford's Tower Keep 1201 !13th century Restored EH ! Reduced in height 1596. Crayke Castle Tower house 1401 !15th century Restored Private 18th- and 19th-century additions and alterations. 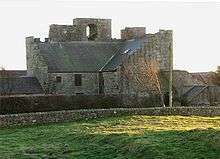 Danby Castle Quadrangular castle 1301 !14th century Fragmentary ruins Private, farm Partly used as farm buildings. Gilling Castle Tower house 1301 !14th century Intact St. Martin's Ampleforth School 16th- and 18th-century additions and alterations. 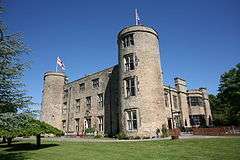 Hazlewood Castle Castle 1201 !13–18th century Rebuilt Hotel Altered in the 18th and 20th centuries, formerly Carmelite retreat centre. Hellifield Peel Tower house 1301 !14–15th century Restored Hotel Restored 2005. Helmsley Castle Castle 1101 !12–13th century Fragmentary ruins EH ! Severely slighted in 1645. Hornby Castle Courtyard castle 1301 !14–15th century Restored Private Converted to country house by John Carr, 18th century. Knaresborough Castle Keep and bailey 1101 !12–14th century Fragmentary ruins HC ! Marmion Tower Fortified manor house 1401 !15th century Fragment EH ! Surviving gatehouse of Tanfield Castle. (Old) Mulgrave Castle Enclosure castle 1101 !12–13th century Fragmentary ruins HC ! 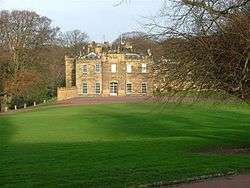 Marquess of Normanby Superseded by 18–19th-century castellated mansion also known as Mulgrave Castle. 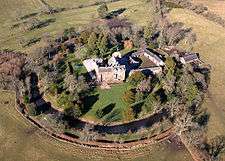 Nappa Hall Fortified manor house 1459 !1459 Intact Private Enlarged in the 17th century, little altered since. Richmond Castle Keep and bailey 1001 !11–14th century Ruins EH ! Keep 100 ft (30 m) high. Ripley Castle Tower house 1401 !15–16th century Rebuilt HH ! Extended in 1783–36 in Gothic Revival style. 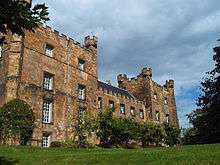 Skelton Castle Castellated house 1201 !13–19th century Intact Private 18–19th-century house incorporates remains of medieval castle. Skipton Castle Castle 1101 !12–17th century Restored HH ! Partly demolished in 1649, rebuilt in 1657–58. Snape Castle Castle 1401 !15–18th century Partly ruined Private Mostly reconstructed in the 17th century. 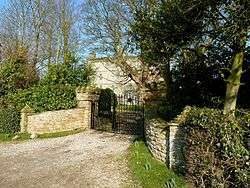 South Cowton Castle Tower house 1401 !15th century Restored Private Altered in the 19th century, farmhouse. Whorlton Castle Castle 1301 !14–16th century Fragmentary ruins HC ! Remains of gatehouse. 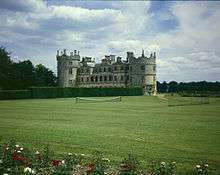 Wilton Castle Neo-romantic castle 1810 !c. 1810 Intact Private apartments By Smirke on site of medieval castle. Halloughton Manor House Pele tower 1301 !14th century Intact Private Attached to later building. 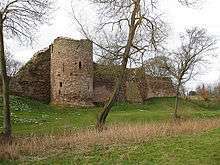 Newark Castle Castle 1101 !12–14th century Ruins HC ! / Newark District Council Gatehouse, part of curtain wall and a tower remain. 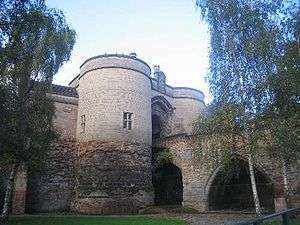 Nottingham Castle Keep and bailey 1101 !12–13th century Fragmentary remains HM ! Bampton Castle Quadrangular castle 1315 !c. 1315 Fragment Private Parts of gatehouse and curtain wall survive in later house, Ham Court. 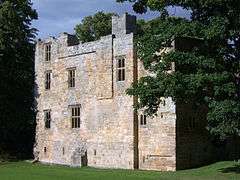 Broughton Castle Fortified manor house 1301 !14–15th century Intact HH ! Remodelled in the 15–18th centuries. 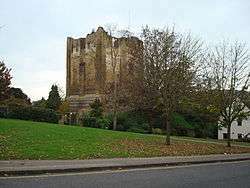 Hanwell Castle Castellated house 1401 !15–16th century Fragment Private Large surviving tower of unfortified building. Oxford Castle Motte and bailey 1001 !11–12th century Fragment Hotel Motte and the unusual, possibly Saxon, St. George's Tower. 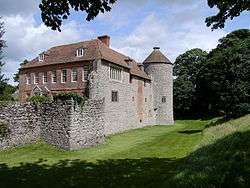 Rotherfield Greys Castle Fortified manor house 1301 !14th century Fragment ENT ! Towers and section of wall survive, close to Greys Court. Shirburn Castle Quadrangular castle 1378 !c. 1378 Rebuilt Private Originally stone, largely rebuilt in brick c. 1720, remodelled in the 19th century. Wallingford Castle Motte and bailey 1001 !11–13th century Fragmentary remains HC ! Slighted in 1652, impressive earthworks remain. Oakham Castle Motte and bailey 1101 !12–13th century Fragment HC ! 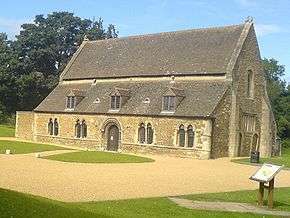 / Rutland County Council Aisled great hall built in 1180–1190 survives. 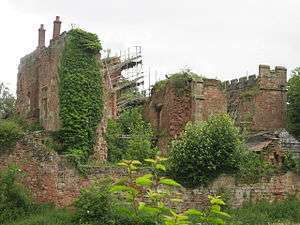 Acton Burnell Castle Fortified manor house 1201 !13th century Ruins EH ! 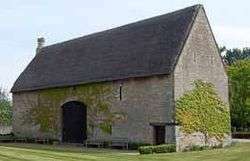 Shell, used as a barn in the 18th century. Bridgnorth Castle Keep and bailey 1101 !12th century Fragmentary remains HC ! Slighted in 1645. Broncroft Castle Fortified manor house 1301 !14th century Intact Private Renovated in the 19th century. 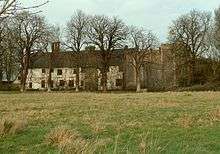 Cheney Longville Castle Fortified manor house 1301 !14–17th century Part habitable Private Building At Risk. 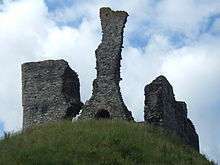 Clun Castle Keep and bailey 1201 !13th century Fragmentary remains EH ! Ruins of keep built onto side of motte. Ludlow Castle Keep and bailey 1001 !11–14th century Ruins HC ! Earl of Powis One of the great Welsh border castles. Moreton Corbet Castle Keep 1101 !12th century Fragmentary remains EH ! Adjoining ruins of a 16th-century building. 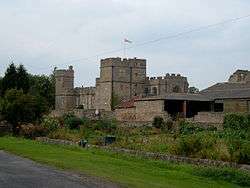 Quatford Castle Neo-romantic castle 1830 !c. 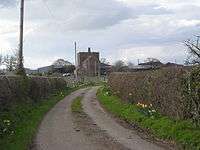 1830 Intact Private Nearby are earthwork remains of the medieval Quatford Castle. Red Castle Castle 1201 !13th century Fragmentary remains. HC ! Overgrown, feature of Hawkstone Park landscape garden. Building At Risk. 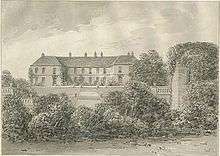 Rowton Castle Sham castle 1701 !18–19th century Intact Hotel On site of medieval castle, remodelled in 1809–12 by George Wyatt. 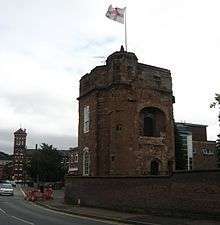 Shrewsbury Castle Castle 1101 !12th century Rebuilt HM ! Shropshire Council Restored and extended in 1642, altered c. 1790 by Telford. Stokesay Castle Fortified manor house 1201 !13–14th century Intact EH ! Restored in the 19th century. 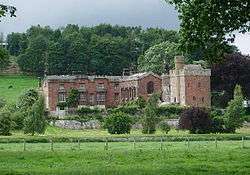 Wattlesborough Castle Castle 1201 !13–14th century Fragment Private Near Rowton, keep/tower survives, adjoining Wattlesborough Hall. Whittington Castle Keep and bailey 1101 !12–13th century Fragments HC ! 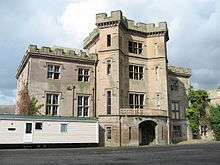 Banwell Castle Neo-romantic castle 1848 !c. 1848 Intact Restaurant Architect not known. Beckington Castle 1601 !17th century Rebuilt Company HQ Medieval remains incorporated in later building. Dunster Castle Castle 1201 !13–19th century Rebuilt ENT ! Existing house dates largely from c. 1571, with 18–19th-century alterations. Farleigh Hungerford Castle Enclosure castle 1301 !14–15th century Ruins EH ! On high ground above the River Frome. Newton St Loe Castle Fortified manor house 1301 !14th century Fragment Bath Spa University Large tower and gatehouse, altered in the 16–17th century. Nunney Castle Quadrangular castle 1373 !1373 Ruins EH ! Towers originally had conical roofs, north wall collapsed in 1910. Stogursey Castle Motte and bailey 1001 !11–12th century Fragmentary remains Landmark Trust 17th-century house built within the remains of the castle. Sutton Court Fortified manor house 1301 !14–15th century Fragment Private apartments Short length of embattled wall and a tower survive, incorporated in large house, restored in the 19th century. Taunton Castle Shell keep 1201 !13th century Restored HM ! 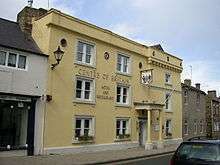 Now houses the Museum of Somerset, Castle Hotel incorporates remains of an outer gatehouse. Walton Castle Sham castle 1615 !1615–20 Restored Private Restored as private house 20th century. Wells Bishop's Palace Fortified palace 1201 !13–15th century Substantially intact HH ! Conisbrough Castle Keep and bailey 1101 !12th century Ruins EH ! Cylindrical keep, castle ruinous before English Civil War, so escaped slighting. Tickhill Castle Motte and bailey 1001 !11–14th century Fragmentary remains Duchy of Lancaster Ruined gatehouse and parts of curtain walls remain. Alton Castle Castle 1101 !12–13th century Fragmentary remains Youth centre Cliff-top position, site partly occupied by a 19th-century building. Caverswall Castle Enclosure castle 1275 !c. 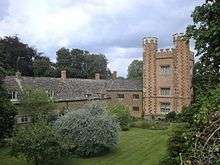 1275 Substantially intact Private Moated, walls and towers reduced in height, a 17th-century mansion built within. 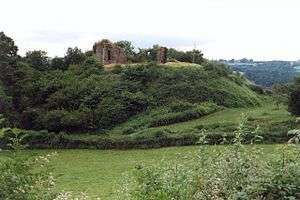 Chartley Castle Motte and bailey 1001 !11–13th century Fragmentary remains Private Altered in 13th century to form enclosure castle, abandoned by 1485. Eccleshall Castle Castle 1301 !14th century Fragmentary remains Private Remains partly incorporated into house of c. 1695, rebuilt in the 19th century. Stafford Castle Motte and bailey 1001 !11–12th century Earthworks HC ! / Stafford Borough Council Medieval keep partly rebuilt in the 19th century, then partly demolished. Stourton Castle Castle 1301 !14–15th century Fragment Private Remains incorporated in later buildings. 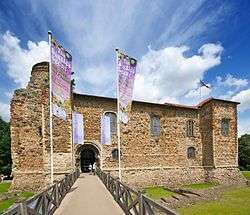 Tamworth Castle Shell keep 1001 !11–13th century Rebuilt HC ! Tutbury Castle Motte and bailey 1101 !12–15th century Fragmentary ruins HC ! Slighted in 1647–48, a 19th-century folly stands on the motte. Bungay Castle Keep and bailey 1101 !12–13th century Fragmentary remains HC ! 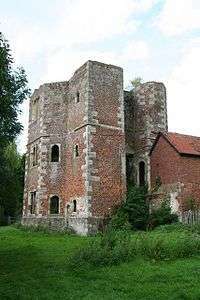 / Bungay Castle Trust Abandoned c. 1365. Clare Castle Motte and bailey 1001 !11th century Fragmentary remains HC ! Motte 53 ft (16 m) high. Eye Castle Motte and bailey 1001 !11th century Fragmentary remains HC ! Motte over 40 ft (12 m) high. Framlingham Castle Enclosure castle 1101 !12th century Ruins EH ! Used as a poor house in the 17–19th centuries. 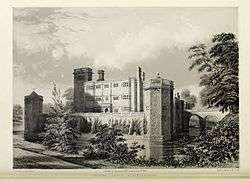 Mettingham Castle Fortified manor house 1342 !c. 1342 Fragmentary remains Private Gatehouse survives. 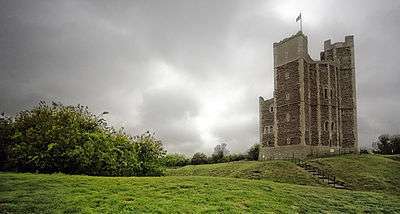 Orford Castle Keep 1165 !1165–73 Intact EH ! Unique polygonal keep survives. Wingfield Castle Castle 1385 !c. 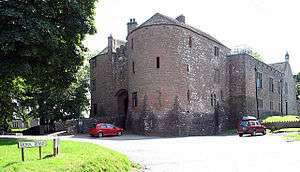 1385 Fragment Private South curtain wall, gatehouse and east drawbridge survive, with a 16–17th-century house. Farnham Castle Keep and bailey 1101 !12th century Substantially intact EH ! Shell keep replaced earlier keep part buried, part remodelled in the 17th century. Guildford Castle Keep and bailey 1101 !12–13th century Ruins HC ! Local authority Tower keep survives, roofless since c. 17th century. Hylton Castle Tower house 1401 !c. 1400 Ruins EH ! Large gatehouse tower, incorporated into an 18th-century house, since demolished. Newcastle Castle Keep and bailey 1172 !1172–77 Restored HC ! / Newcastle City Council Keep and gatehouse survive. 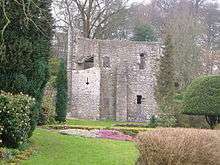 Old Hollinside Fortified manor house 1201 !13th century Ruins On slope overlooking River Derwent. Ravensworth Castle Quadrangular castle 1301 !14–19th century Ruins Private Two towers of medieval castle survive, amidst ruins of later building. Building At Risk. Tynemouth Castle Enclosure castle 1201 !13–14th century Ruins EH ! Built to enclose and protect the priory, modified as artillery castle 16th century. 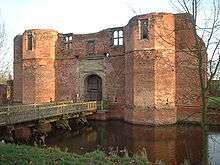 Astley Castle Fortified manor house 1201 !13–14th century Shell Landmark Trust Altered 15–19th centuries, hotel prior to fire in 1978. Modern living space constructed within shell, winner of Stirling Prize 2013. 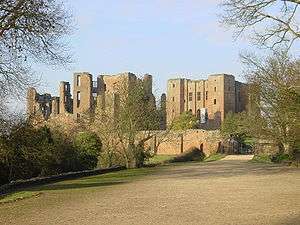 Kenilworth Castle Keep and bailey 1101 !12–14th century Ruins EH ! Altered in the 16th century, slighted in 1650. 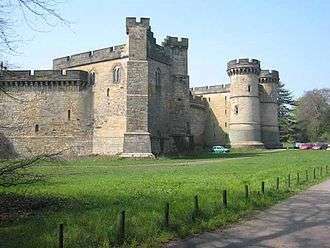 Maxstoke Castle Quadrangular castle 1301 !14–15th century Substantially intact NGS Moated, domestic buildings of 15–19th centuries within curtain walls. Warwick Castle Castle 1201 !13–15th century Intact HH ! Guy's tower rises 128 ft (39 m), 17th-century residential block, remodelled by Anthony Salvin after fire. 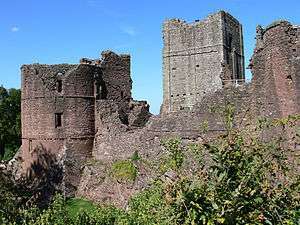 Dudley Castle Keep and bailey 1201 !13–14th century Ruins HC ! Dudley Zoo Slighted in 1647, then rebuilt and inhabited until destroyed by fire in 1750, partly restored in the 19th century. Amberley Castle Castle 1377 !1377–82 Partly habitable Hotel Remodelled in the 16th century and later, incorporates a 12th-century manor, working portcullis. Arundel Castle Keep and bailey 1101 !12–13th century Heavily restored HH ! Duke of Norfolk Remodelled in 1791–1815 and 1890–1903. 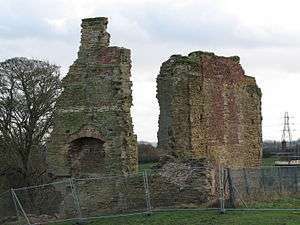 Bramber Castle Keep and bailey 1001 !11–12th century Fragmentary remains EH ! Commanding position, earthworks and fragment of wall remain. Halnaker House Fortified manor house 1201 !13–14th century Ruins Private Altered in the 18th century, fell into ruin 1880s, replaced by later house of same name. 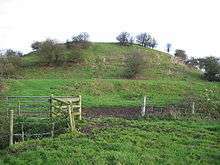 (Old) Knepp Castle Keep and motte 1214 !1214 Ruins Private 11th century motte, with keep added in 1214. Mostly demolished in 1726. Dobroyd Castle Sham Castle 1866 !1866–9 Intact Activity centre By John Gibson. Harewood Castle Tower house 1301 !14th century Ruins Private Shell of tower, substantially intact, within Harewood House estate. 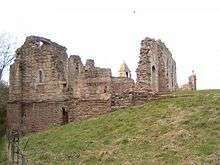 Pontefract Castle Enclosure castle 1101 !12–13th century Fragmentary remains HC ! 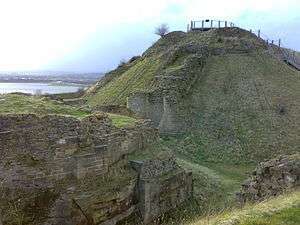 Sandal Castle Motte and bailey 1101 !12th century Fragmentary remains HC ! Well-preserved earthworks, excavated site with visitor centre. Devizes Castle Neo-romantic castle 19 !19th century Intact Private apartments Present building begun 1842 on site of important medieval castle. 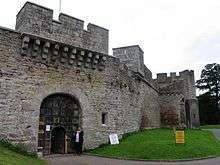 Longford Castle Sham castle 1591 !1591 Intact Earl of Radnor Remodelled in the 18th century. Ludgershall Castle Ringwork 1001 !11–13th century Fragmentary remains EH ! Remains of a tower and extensive earthworks. Old Sarum Castle Motte and bailey 1001 !11–13th century Fragmentary remains EH ! On site of Iron Age hill fort. Old Wardour Castle Castle 1393 !c. 1393 Ruins EH ! 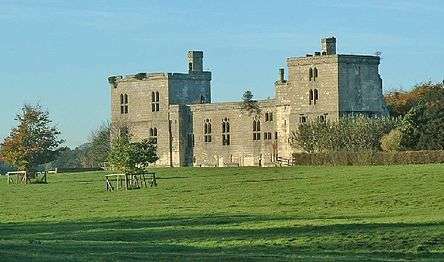 Remodelled in the 16–17th centuries, superseded by Palladian building known as New Wardour Castle. 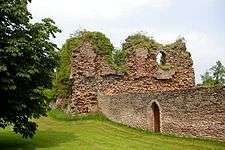 Caldwall Castle Fortified manor house 1401 !15–16th century Fragment Private Single surviving tower, in Kidderminster, Caldwall or Caldwell. Hartlebury Castle Fortified manor house 1401 !15th century Rebuilt HM ! Church of England 15th-century remains incorporated in later buildings, residence of Bishop of Worcester until 2007, houses Worcestershire County Museum. Holt Castle Castle 1301 !14–19th century Intact Wedding venue Medieval tower incorporated in later buildings. Worcester Castle Castle 1201 !13–14th century Fragment Church of England Edgar Tower, now the entrance to College Green, may incorporate the remains of a castle gatehouse. 1 2 3 4 5 6 7 8 9 10 11 12 13 14 15 16 17 18 19 20 21 22 23 24 25 26 27 28 29 30 31 32 33 34 35 36 37 38 39 40 41 42 43 44 45 46 47 48 49 King (1983). ↑ Higham & Barker (1992), pp.194–198. 1 2 "Pendennis Castle" PSC. 1 2 Brown (1962), p.146. ↑ Creighton & Higham (2003), p.64. 1 2 "Bamburgh Castle" PSC. 1 2 3 "Belvoir Castle" PSC. ↑ Impey & Parnell (2000), pp.118–121. 1 2 "Peckforton Castle" BLB. ↑ Renn (1984) pp.277–278. See King (1988), p.173 for how some people criticised the inclusion of Henry VIII's artillery forts in King's index of castles, Castellarium Anglicanum. 1 2 "Portchester Castle" PSC. 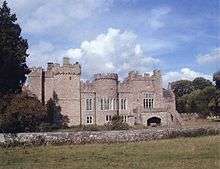 ↑ "Greystoke Castle " PSC. 1 2 "Thurland Castle" PSC. 1 2 "Corby Castle " PSC. ↑ "Carn Brea Castle" PSC. ↑ "St. Catherine's Castle" PSC. ↑ "St. Mawes Castle" PSC. ↑ "St. Michael's Mount" PSC. ↑ "Brackenburgh Old Tower" PSC. 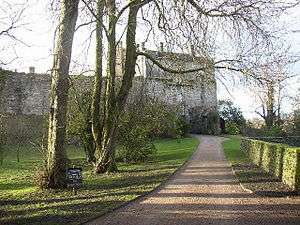 ↑ "Berry Pomeroy Castle" PSC. ↑ "Sherborne Old Castle" PSC. ↑ "Paull Holme Tower" PSC. ↑ "St. Briavel's Castle" PSC. ↑ "Ewyas Harold Castle" PSC. ↑ "Brampton Bryan Castle" PSC. ↑ "Defending the Castle". Retrieved 10 February 2015. 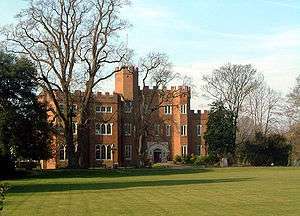 ↑ "West Cowes Castle" PSC. ↑ "Otford Palace 1" "Otford Palace 2" BLB. ↑ "St. Leonard's Tower" PSC. 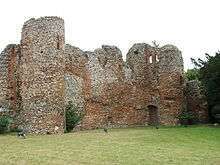 ↑ "Sutton Valence Castle" PSC. ↑ "Ashby de la Zouch Castle" PSC. ↑ "Kirby Muxloe Castle" PSC. ↑ "Castle Acre Castle" PSC. ↑ "Castle Rising Castle" PSC. ↑ "Thorpe Waterville Castle" PSC. ↑ "Alnham Vicars Pele" PSC. ↑ "Cockle Park Tower" PSC. ↑ "Corbridge Vicar's Pele" PSC. ↑ "Hexham Moot Hall" PSC. 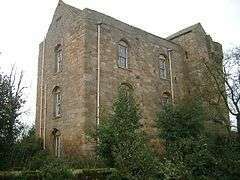 ↑ "Hexham Old Gaol" PSC. ↑ "Prior Castell's Tower" PSC. ↑ "Old Mulgrave Castle" PSC. ↑ "Sheriff Hutton Castle" PSC. 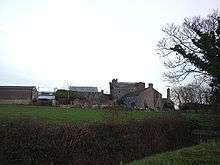 ↑ "South Cowton Castle" PSC. ↑ "Halloughton Manor House" PSC. ↑ "Acton Burnell Castle" PSC. ↑ "Cheney Longville Castle" PSC. ↑ "Moreton Corbet Castle" PSC. ↑ Buildings of England, Somerset: South & West (1958) ISBN 978-0-300-09644-6. 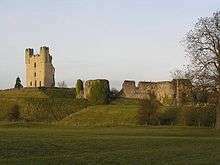 ↑ "Farleigh Hungerford Castle" PSC. ↑ "Newton St Loe" PSC. ↑ "Wells Bishop's Palace" BLB. ↑ "Old Sarum Castle" PSC. 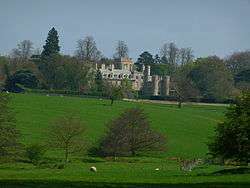 ↑ "Old Wardour Castle" PSC.